Today we're sending out a great big Green Roof Grower thank-you to two generous Chicago companies for their support of our SIP (sub-irrigated planter) workshops and home food gardens for local Chicagoans. 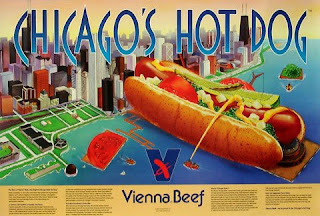 First, Vienna Beef. If you've never had a Chicago-style hot dog you might want to put it on your to-do list. Click here to read all about the dog itself and also to see the cool Vienna Beef Factory Store and Cafe, where we pick up their donation of two bright yellow kosher dill pickle buckets every week. Vienna Beef is an active participant in our community, with links to the Greater Chicago Food Depository. To Janice, Wally, and all the helpful VB employees: you guys are the best. Bruce steps in to help Erika, one of our workshop participants, drill out a Vienna Beef pickle bucket before it's planted with an heirloom tomato seedling. Using these recycled buckets in our workshops is a way to keep the cost to participants relatively low. The Chicago grocery chain Jewel-Osco is living up to its commitment to support hunger relief, nutrition education, and environmental stewardship with its donation of more than 100 food-grade buckets. Last weekend our new friend Cory and his folks Mark and Kathy delivered the recycled buckets, clean as a whistle with not a trace of the vanilla frosting they held in their original incarnation. Our real champions here are the drivers for both companies who linked us to corporate: last year, Bruce's neighbor Rey Ramos, who drives a delivery route for Vienna Beef, gave us our first supply of yellow pickle buckets. And now Cory's dad. Do you know someone who drives for a food company? See if they might be able to swing a donation for your SIP garden. Everyone wins in this collaboration: buckets don't end up in landfills, companies build goodwill in the community, and anyone who takes a few minutes to drill them out into SIPs and plant them winds up with a renewable source of fresh food. Thanks again for all the great donations.